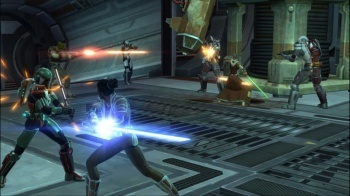 The publisher wants The Old Republic's launch to be as smooth as possible. EA and BioWare have decided to limit the number of copies of Star Wars: The Old Republic that will be available ahead of the game's launch in order to ensure that the game starts out on a good footing. This limited stock will apply both to physical copies, and to digital copies bought through online distributors. EA said that it didn't want to be in a situation where people had to queue to get into the game, or where the servers couldn't handle the numbers. EA said that it would rather provide a good experience for a smaller number of people, than a bad one for a larger group, and that there was a cutoff point for digital sales. If it hit this limit, EA would then start working to expand server capacity as quickly as possible. This isn't the first measure that EA and BioWare have taken to ensure a smooth launch for the game; the Old Republic's director, James Ohlen, said that the reason that BioWare hadn't revealed the game's release date yet was so that it could work on a smooth launch without a specific date looming over its head. Star Wars: The Old Republic comes out for PC later this year, although if you want to play it at launch, you might want to get your pre-order in sooner rather than later.